Heads up! 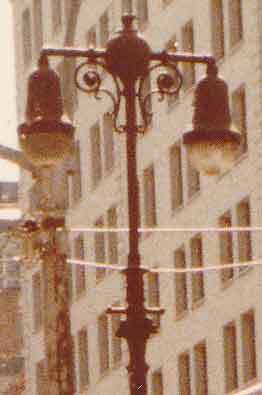 Here are the heads of a few old cast iron twin lamp lamp posts that were still hanging around on 5th Avenue in midtown Manhattan, when I took these photos with my lovely 110 camera in 1982. The first lamppost was from the turn of the century, that being the 20th century for any of you who aren't aware life existed before 2001. In its original condition the twin masts would have probably sported arrow like finials at each end, and its luminaires would have hung down on extensions installed before the finials. This pole had to accept some degrading of its original look in order to survive these many decades. At some point, probably the 1940s, it was fitted with Bell type light fixtures. 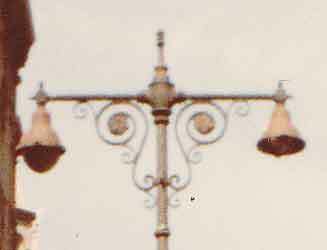 The finials and original drop extensions were traded in for simple elbow fittings stemming from the truncated ends of the mast arms, in an arrangement that was unusual for the Bell fixtures as well as the lamppost. The Bells were usually hung pendant style off of drop extensions. For the Cuplight luminaires that came later, the elbow fitting rigging wouldn't have been all that uncommon. 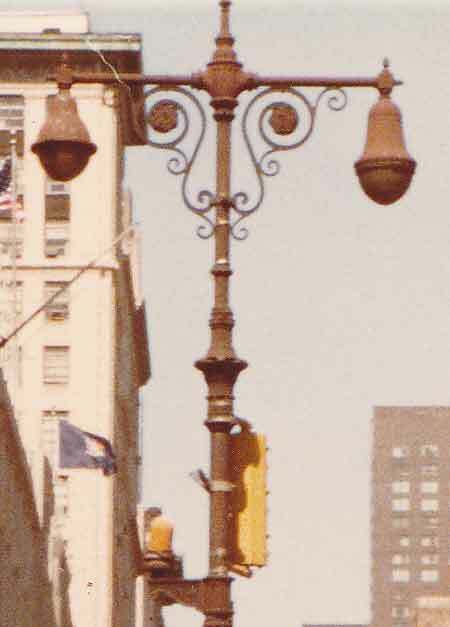 A few blocks north on the corner of 5th Avenue and West 28th Street stood a later generation cast iron twin lamp, dating probably from the 1930s or 1940s. This one had the last generation of incandescent fixtures used in New York City, the Westinghouse luminaire I named the Cuplight. This twin lamp is looking a bit unbalanced with one of the Cuplights missing its diffuser bowl. Another 4 blocks north at the corner of 5th Avenue and 32nd Street, a latter generation twin lamp holds both a Cuplight and a Bell, both still in good shape. When you're a decades old survivor just by sheer luck and oversight by crews replacing your siblings up and down the avenue, you learn not to complain about little annoyances like the lack of symmetry due to different types of light fixtures placed on you. As I enjoy repeating myself, I feature these lampposts full length in the Cast Iron section.